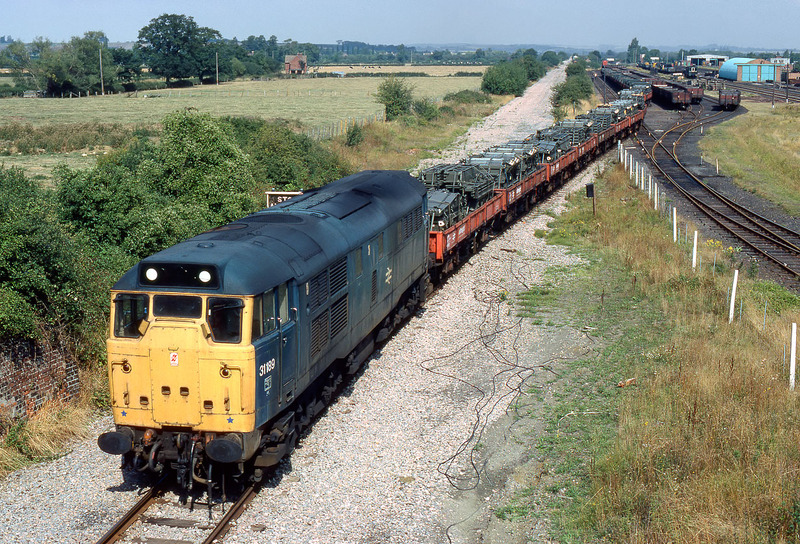 31189 leaves Long Marston army depot on 6 September 1984 with a lengthy train of Royal Engineers bridging equipment. As with most MoD traffic at the time, this would travel on to Worcester, rather than reversing and heading down the Cotswold Line to Oxford. This explains why I have very few pictures of these trains, plus of course the sporadic nature of the traffic. The track of the former line to Stratford-upon-Avon had not long been lifted when this picture was taken, and shows up as a line of clean ballast visible all the way to the site of Long Marston station in the distance.